Payout is based upon gas production from March. Hugoton Royalty Trust (NYSE:HGT) announced yesterday its May monthly distribution of $0.084818 per unit, based principally upon production during the month of March 2013 by XTO Energy (UNKNOWN:XTO.DL). The board of directors said the dividend is payable on June 14 to the holders of record at the close of business on May 31. The trust reported that gas production for the properties from which the royalty was carved totaled 1,477,000 million cubic feet with an average gas price of $3.89. Additionally, XTO advised that included in the May 2013 distribution is approximately $1,188,430 -- $950,744 net to Hugoton -- from the sale of properties underlying its Oklahoma property's net profits interests. Hugoton also has interests in properties in Kansas and Wyoming. Hugoton Royalty Trust was created on Dec. 1, 1998, when XTO Energy conveyed 80% net profits interests in certain predominantly gas-producing properties located in Kansas, Oklahoma and Wyoming to the trust. The trust was created to collect and distribute to unitholders monthly net profits. Hugoton and XTO are currently in arbitration over whether costs associated with litigation XTO was involved in should be deducted from the Trust's revenues. The latest payment would equate to a $1.02-per-share annual dividend, yielding 10% based on the closing price of Hugoton Royalty Trust's stock on May 21. The most recent payment was $0.063863. 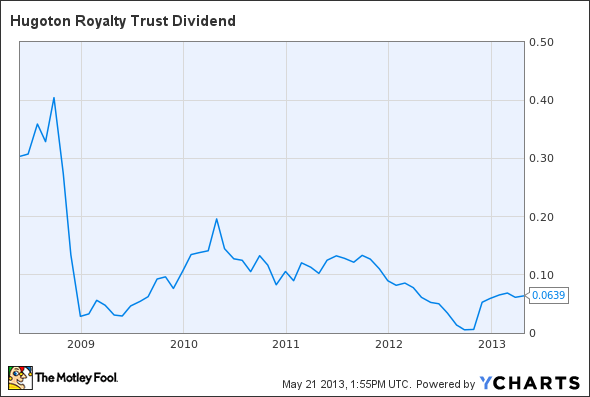 HGT Dividend data by YCharts. Chart does not include just-announced payment.